Hua Hin is a great walking city: this quiet seaside community features public spaces, parks, temples, town center, restaurants, and street side eateries, most within walking distance of residential sites. For beach walking, Hua Hin beaches fit description of good walking beaches: Flat, long-stretch, hard-packed sand, rocky headlands, beautiful water, and clean fresh salt air. Proximity of the beach to every creature comfort is a big plus, making it a breeze to stay fit too. Lace up those walking shoes, lather on sunscreen, grab a hat, and stroll through Hua Hin. Here is what to do. Getting started: The right walking shoes aren’t just a marketing ploy. They are specifically designed for how we walk. When we walk, our feet land on the heels. The heels of walking shoes are often slanted to increase stability. That stability is important when we roll forward and push off with our toes, as we do when we walk. It is less likely to trip because the soles of walking shoes are smoother than those of running shoes. These walking-specific features can help keep us injury-free to cruise Hua Hin city, hoof along the seashore, and stroll Hua Hin night market. 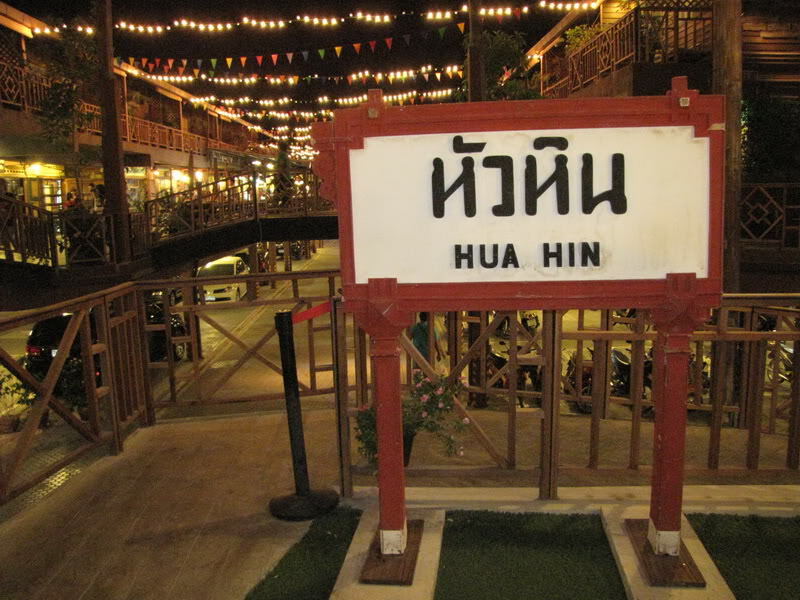 Go to Hua Hin Market Village and test out a pair of walking shoes and synthetic fabric socks-they wick away sweat and keep feet dry and blister-free better than 100 % cotton. 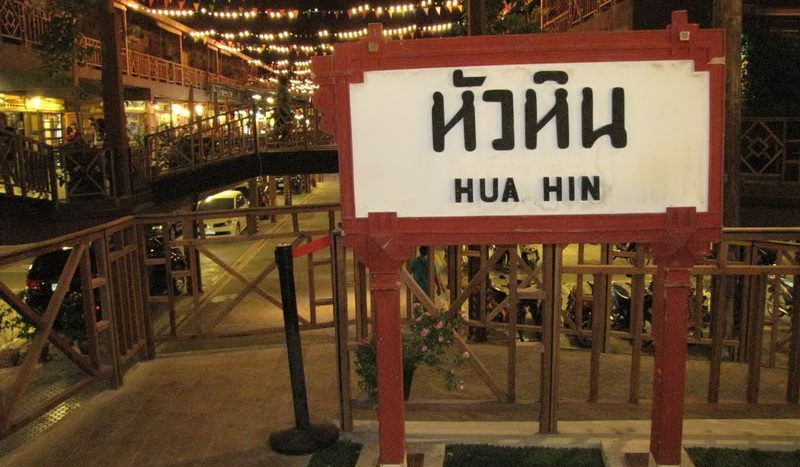 Around town: Hua Hin is steeped in history. Visit the train station. Start around the old Railway Hotel-the Central Sofitel Hotel and work your way toward the Royal Hua Hin golf course which has a public walk paths, it will take you to scenic point at Khao Hin Lek Fai. This is about 7 kilometer stretch westward and you should cover the length in one and a half hours. Get a map from Tourism Authority of Thailand, Hua Hin branch on Petchkasem Rd. and plan your next trip to Klai Kangwon Palace. Along the shore: You may want to get out early for your morning walk along the 5 kilometer stretch of sand. Hua Hin beach front is lined with colonial styled wooden Thai family cottages, resort bungalows, tastefully landscape private condominiums, and world class hotels; this make the view pleasant. Walking in soft sand may wake up muscles in your legs you never knew you had. From November to February due to high tide, the beach is not passable after the Chiva-Som resort. If you started out from Hua Hin center toward Khao Takiap (south), for a good work out, climb (on foot) to the hill top temple for a little more exercise and spectacular view, which still leave you time to meet with your friends for coffee and breakfast afterward. If you go to that fancy coffee place at Naresdamri, you might even run into a celebrity or two. After dark: Put on light color or reflective clothing, grab your partner and a flashlight and head out. In the evening, walk toward the fishing pier to observe the hive of activity and see daily catches being unloaded and watch the fishermen preparing to go out to sea. Then head back on Chomsin Rd. toward Chatchai Market, to Hau Hin night market which can be fairly crowded on weekend nights. Stroll around Damnern Kasem Rd. for international flavor (meals and population). Walking is a good way to get a glimpse at everyday life of Hua Hin, to see your neighbors, to savor the seasons, and to get in touch with nature. Walking also provides all the aerobic exercise you need to maintain over all good health and to energize cardio-pulmonary system. Incorporate both leisure (sightseeing) and fitness (walking) is a good thing for your body and soul.